If you haven’t heard of rocket stove technology yet, I encourage you to look into it and take it seriously. Unlike traditional wood stoves, rocket stoves operate on a double burning principal, where first the wood is burned, then the smoke is burned in a secondary chamber. This has the effect of eliminating smoke almost completely, and requiring far less fuel than a conventional woodstove. Also, rocket stoves are designed to be so simple than anyone can make one with a few standard tools in an afternoon. 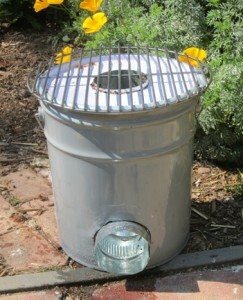 This particular rocket stove design (there are many) uses a metal five gallon bucket. I will be building one of these for myself as soon as I can find a source for metal five gallon buckets, which are harder to find than the plastic variety.